Recently we decided to freshen up the RetroPlanet company lunchroom. 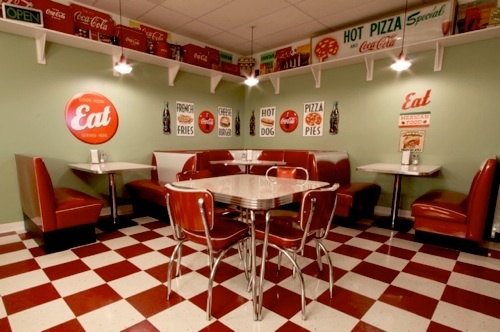 If you haven’t seen pictures of it before, our employee breakroom is filled with our great retro style furniture, giving it the look of an authentic 50s diner and making it a fun place to lunch or take a break for all of us, as well as serving as the furniture showroom. The walls needed a fresh coat of paint and, truth be told, we were getting a little tired of the signs that were hanging there. So we decided to display not only different signs, but a bunch of our newer, RetroPlanet-designed signs. 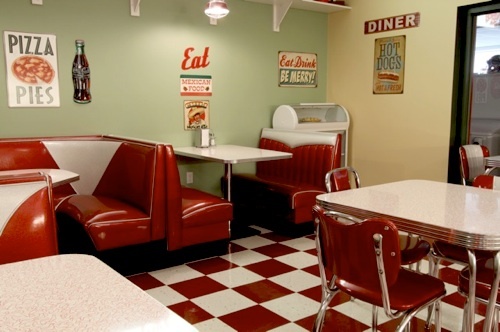 These new diner tin signs were made to look like real vintage finds. 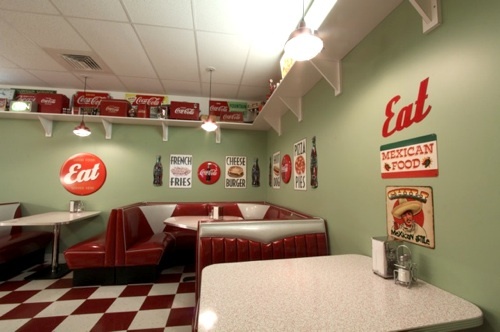 Some were inspired by signage from old eateries (like our Eat signs). Sprinkle in some embossed Coca-Cola bottle and button signs, and we think we’ve created a pretty cool look that coordinates really well with the antique and vintage items we display on the shelving throughout the room. Where previously our walls had all been painted white, for this room redo we chose to paint two of the walls in a green called Affinity Seedling, and the two remaining walls in a yellow-beige that is called Affinity Safari. 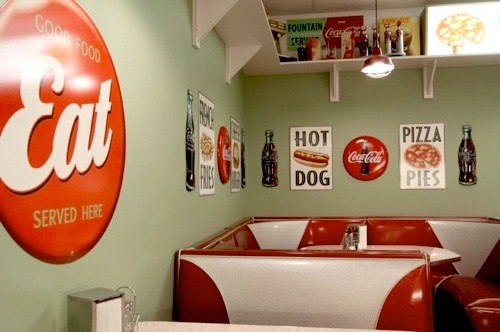 Both colors are by Benjamin Moore and make a terrific contrasting backdrop to the extensive Coca-Cola collection of signs, coolers and other great memorabilia. The finishing touch to the room was a new clock. We decided to hang the Fifties Wall Clock with the Chromium Plate finish and at a 14.5-inch diameter, it’s easy to keep track of the time and your lunch breaks! We hope you’re feeling inspired to freshen up a room in your home or business. It doesn’t really take a lot to get a great new look when you blend things you already have with a smattering of new ones. And fresh paint always gives you instant results. And remember, we love to receive photos of your projects. If we think they’ll inspire others, maybe we’ll post them on our site! 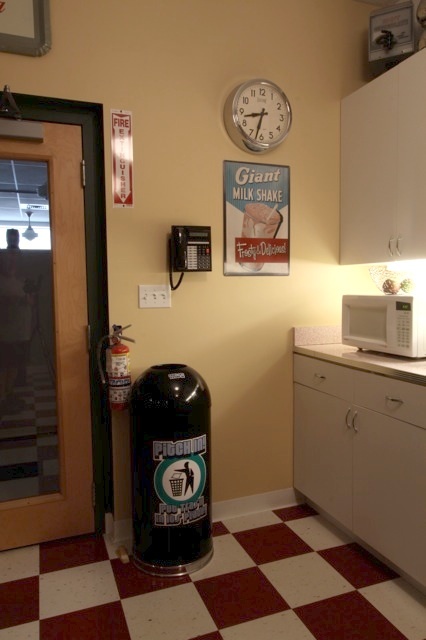 This video shows what our break room used to look like before the redo and is sure to give you some cool decorating ideas, too!